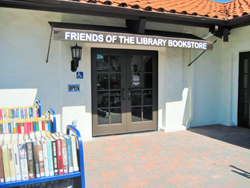 The San Clemente Friends of the Library (FOL) is an organization of volunteers who support the San Clemente Library. They are a non-profit corporation that was organized in 1968 and started selling books in the library lobby in 1982. Through the generosity of local residents and businesses, and with the help of grants, the FOL Bookstore was opened in June 1998. The FOL Bookstore is the primary source of funds and is maintained by volunteers. To stimulate public awareness and support library facilities and programs. To encourage understanding and communication between the library & the community. To enhance the library with gifts, services and endowments. Summer Reading Program oriented toward children. Purchase of books, magazines, computers and other equipment. Presentation of guest speakers and other educational services. The Friends of the Library is a 501c(3) tax exempt organization*. If you appreciate what the library has to offer and would like to become a volunteer, contact one of our volunteers at the Bookstore using our website form or at 949-276-6342. *Per IRS Letter of Determination dated March, 1971. Stop by the Friend’s Bookstore and pick up a copy of the Ralphs letter with instructions or download it here. Ralphs will link your card to SCFOL so we will then receive 2% of all your future purchases. Pick up a couple extra and hand them out to family and friends!